MUCH ADO ABOUT STUFFING: Thanksgivvakah Round-Up. How about a Turkey Shaped Challah? Thanksgivvakah Round-Up. How about a Turkey Shaped Challah? 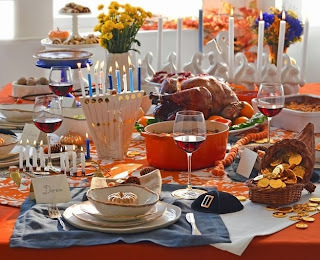 So exciting to think about all the crazy things that you can do with the confluence of Thanksgiving and Chanukkah! What about making this Turkey Shaped Challah, and using it as a Hanukkiah? (Menorah). Just stick some of those birthday candle holders into the "feathers" and you're good to go! 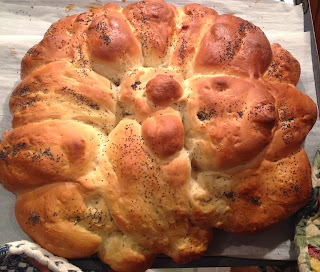 The Challah recipe is here. Channel your inner kindergartener, and just roll the ropes of dough into your desired shape, arrange it on parchment baking paper and bake. Blog-land is positively exploding with good and not so- ideas. 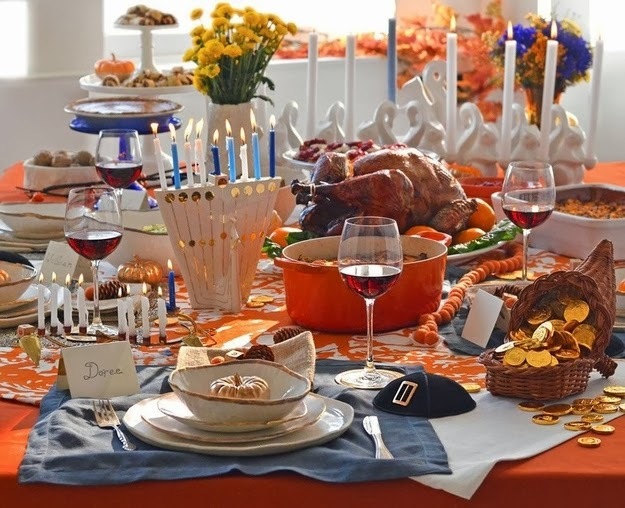 Buzzfeed's Table setting isn't too tacky-- but I don't know about those pilgrim-buckle kippot. Check out Bon Appetit, whose "anti-test kitchen came up with the worst Thanksgivukkah Menu ever, for a good chuckle (gobble?). And it's not too late to stock up on some holiday themed Chotchkes over at Modern Tribe. Look at the great site that Jewish Boston has put together-- lots great ideas and kiddie-fun projects for the holiday! Joy of Kosher has some ideas that are pretty good. And I have to say that these pecan-pie rugelah look darn good (if a dairy dessert isn't a non-starter at your house). You could adopt our tradition of Second Dessert though! Do click the link for great recipes there.